Canon Canada, online at estore.canon.ca, is your official destination for Canon products. Canon Canada offers office printers, photo printers, scanners, laser copiers, faxphones, ink and toner, Canon point and shoot cameras, Canon digital SLR cameras, a wide collection of lenses and flashes, standard and high definition camcorders, binoculars, calculators, and accessories. Canon Canada carries all things Canon, and offers warranties on their great selection. But before you shop, get all the latest estore.canon.ca discounts, Canon Canada promotions, and Canon Canada coupon codes found here at RetailSteal.com. 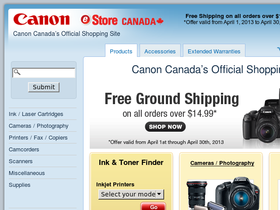 Canon Canada offers free ground shipping on orders over $100. There may be additional fees for express shipping and for environmental handling regulations. See site for more information. Shop at Canon Canada today and enjoy a 10% discount on select Canon Digital SLR cameras. Click here to shop. Enjoy free standard shipping from Canon Canada. Offer valid for purchases over $15. Save up to 10% or more on select all-in-one printers from Canon Canada. Click here to save. Shop at Canon Canada today and save up to 10% on select canon lenses. Click here to get started. Save 10% on select binoculars from Canon Canada. Click link to shop today and save. Save up to $100 on select Canon high definition camcorders from Canon Canada. Click here to shop. Save up to $60 on select Canon point and shoot cameras from Canon Canada. Shop now and enjoy. Get the PIXMA iP2700 photo printer for only $50 from Canon Canada. Shop today and save.